The Jazz Guitar Chord Gig Bag Book, with over 1000 jazz guitar chord voicings in tab format contained within, is an essential resource for jazz guitarists, whether they're amateurs looking to improve on their basic knowledge, or seasoned players looking for an invaluable reference guide. The handy and compact layout of this convenient chord book allows you to quickly and easily find the exact chord you are looking for. Included is a logical layout of the almost innumerable harmonic variations of each guitar chord, as well as the great reference system for substitutions and related chords. 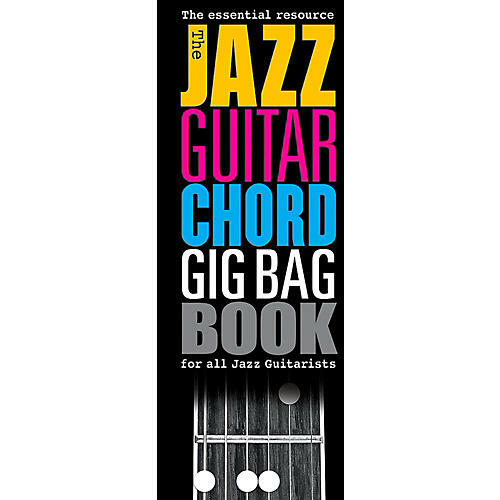 This makes the Jazz Guitar Chord Gig Bag Book absolutely essential for any guitarist looking to expand their harmonic horizons. Wire-bound.